Klamath Falls, OR police badge #8 worn by officer Carl Cook, circa 1930. 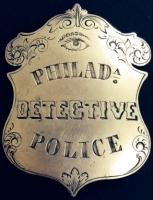 Officer Cook was born March 19, 1887. In 1917 at age 20 he enlisted in the U. S. Marine Corps and was sent to the Phillipine Islands, then to Peking China in 1918 and Nicaragua in 1927. 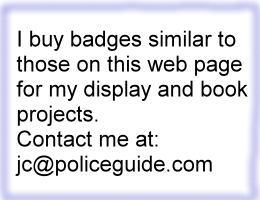 Klamath Falls Oregon Police Reserve badge. Portland, OR Police Captain John T. Moore pictured wearing a 1st issue badge. Portland Oregon Deputy Police badge 1946. Oregon Mounted Posse, Governor's Guard, Salem badge, sterling silver. 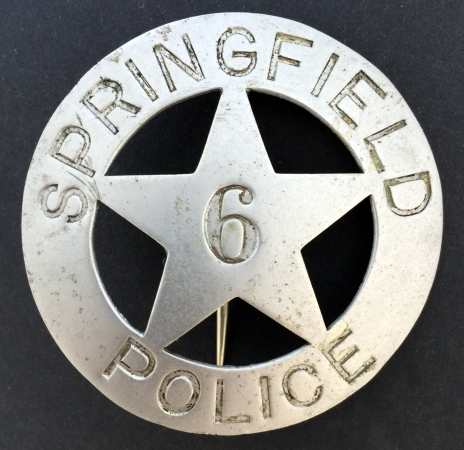 Springfield Oregon Police badge #6. 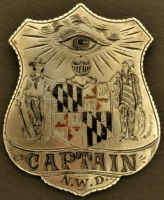 Hallmarked PC Stamp Wrks. Portland.